And So It Begins Again … Spring is on its way! 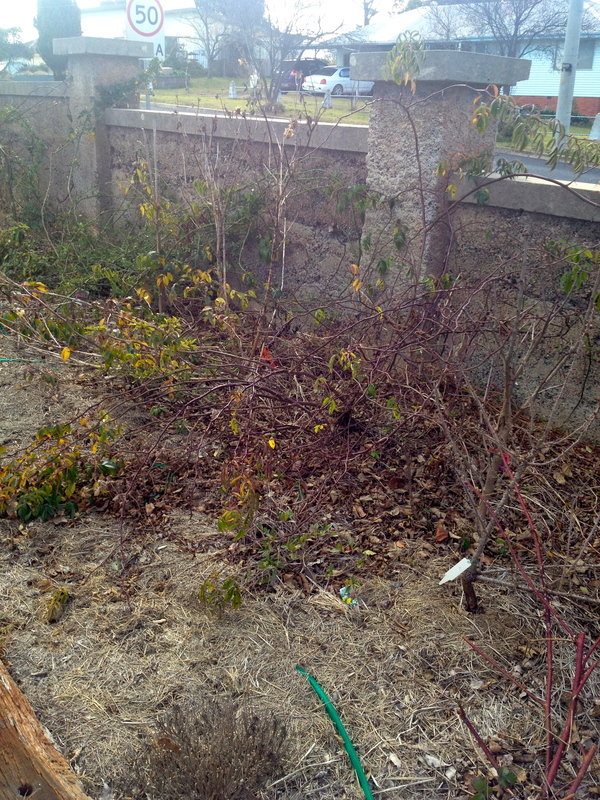 The Desolation of St Dominic’s – the bare old rose bushes that need solid pruning. I’ve just structured this into a more formal garden bed with sleepers which should also help with maintenance of the roses and display them to full effect. We’ve had an unusually cold Winter – not that I’m complaining. After opening a wool shop in Summer, it was Serendipity to have a really cold Winter, including uncharacteristic snow and lots of frosts. 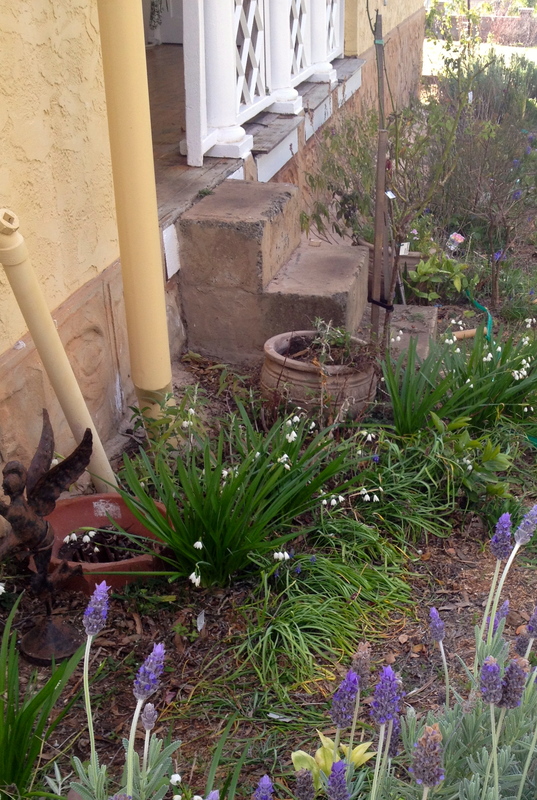 First section to tackle – on the verandah side. The lavenders and snowflakes brighten up this otherwise bleak corner. In Kandos, Winter frosts mean that you can’t prune back in Winter – you leave all old growth so that new growth isn’t encouraged that will be burnt off by the savage frosts. All extra coverage also helps protect other plants and as my garden is mostly all under two years old, the plants need all the protection they can get. However this also means that come end of Winter/the dawn of Spring, there is a mega flurry of activity to cut back, prune, feed, plant and mulch – not forgetting lots of watering for new growth during a very dry period. The last few months have been tough with family, so it’s therapeutic to get back into the garden with gusto (or more) and put some effort into activities that will richly reward in months to come. 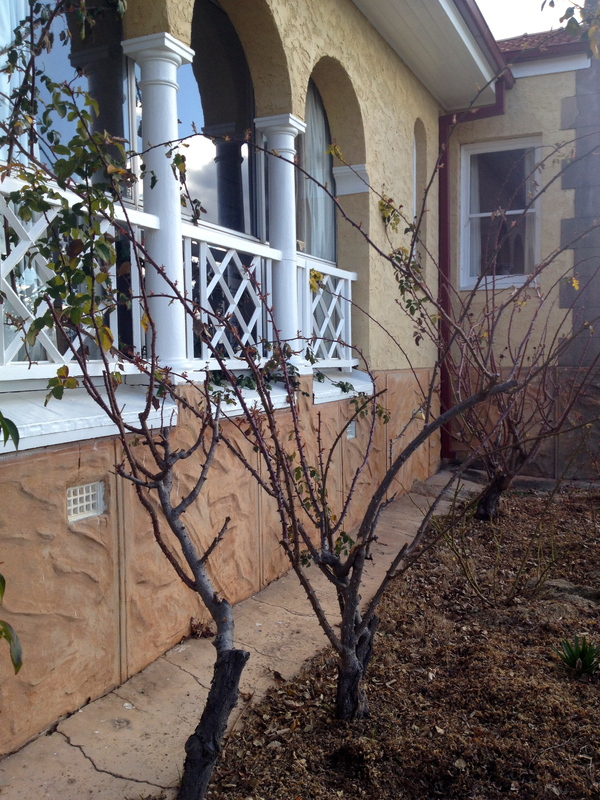 The roses have already started to burst through and are sprouting, so pruning is a priority. There are seven old established roses that need lots of pruning, but the other roses (well over 100) are all new and need much less effort. I’m not sure why I ordered another 22 from Treloars or where they will go – yet another job on the list. 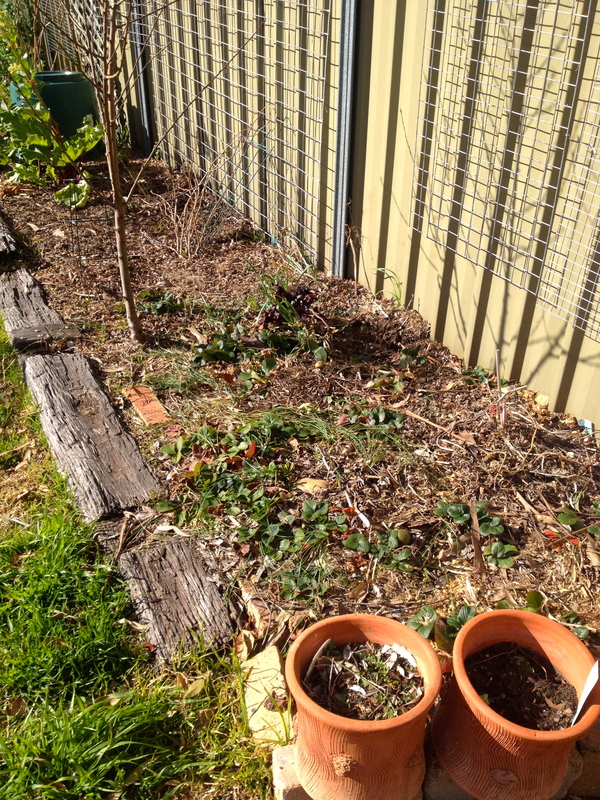 First cab off the rank – my replanted Strawberry bed. I have great hopes (well, at least, better) for my berries this year. What I am recognising is that I’m making lots of work for myself. The Convent garden for decades was a formal showplace – but the nuns had a gardener and lots of locals and schoolboys who all helped with gardening duties. I have just me, and my plan to turn this back into a beautiful traditional established garden is now dawning on me. Two years in and it’s a lot of work with well over half an acre (nearly an acre if you include the block next door, but that’s not on the agenda this year), although in fairness, this is the few weeks that most effort is required and should give the most returns if done properly. I don’t have a real style yet in attending the garden – there is sort of a priority list – prune roses, fix a single area – but I find myself pruning a few areas, feeding a section, trimming a few lavenders, weeding another and then wandering off to another section. I guess it all contributes in the end. I’ve never had a garden I felt was mine, let alone such a substantial one (and one that is in “Creation” mode) so much of this is new to me and there are plenty of mistakes along the way. I use the internet and books all the time to check simple things like when to cut lavender, when to plant beans, when I can start cuttings of certain plants, but it is so exciting when it actually works! Anyway, anything I do does make a visible difference post the ravages of Winter. Given roses are starting to spring forth with life, pruning is priority No. 1, particularly for the old original roses. I don’t think the locals would forgive me if I killed these as the Convent was well known for it’s wonderful rose display and I’ve only been left with a small sample of the original bounty. Priority No.2 is to get some veg into garden beds as I want to be able to harvest plants to eat! Other than that, it’s good housekeeping, with the key driver being Kandos Gardens Fair on 2 and 3 April 2016, given the Convent will again open her doors to the public and put herself up for display. The last time the Convent was open was for Cementa_15 in April this year and with the numbers of people through the gate, I like them to see changes to the newly established garden each time. I’m hoping by Autumn we will be in pretty good shape and the roses in particular look just a little more established. The 20 kilos of rose food bought today might just encourage them a little! The weather at the moment is glorious (although very dry) so I’m hoping today is a mammoth garden day and I get to make an impression on a few areas. 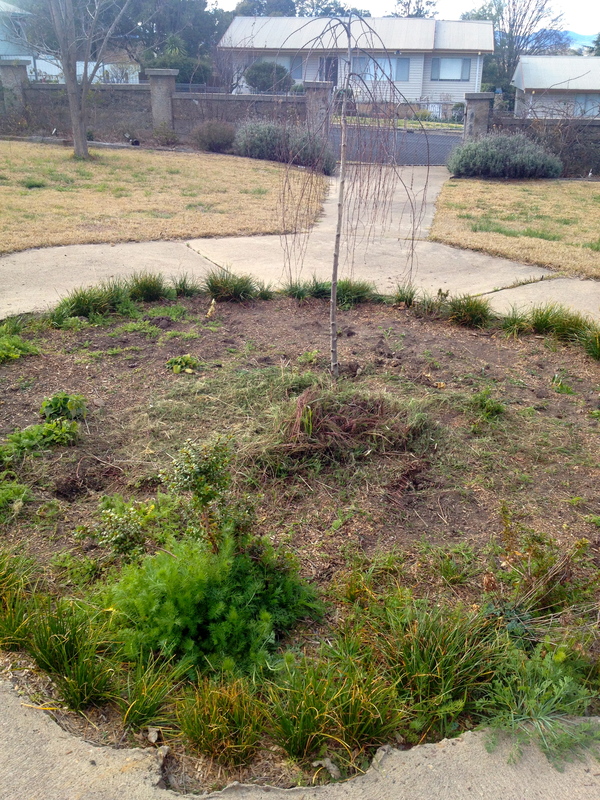 This is the worst the circular front bed has looked for ages and needs a makeover. I’ll keep the bulbs and annuals but am adding some rose bushes for height and mid level flowering.